If you’re in the market for a new phone, buying one second hand could be a great route to save yourself some money. You can get your hands on some extremely decent phones, which might only have been launched last year. However, you do need to exercise some caution. While buying a used phone could save you money, it could cost you money in the long run if it isn’t going to last, or if you discover it is stolen. There are a few top tips to follow which will ensure that your second hand phone delivers exactly what you expect. First you need to decide which handset you want. Is it the iPhone X or the Galaxy S8? Whatever you’re after, remember to take age and spec into account. It is best to think about the minimum model you’re prepared to settle on, and think about operating system. Do you want to run a more recent Android or iOS system? Are there any features which you love that you know you want your next handset to have? Set your goals and stick with them. This phone may be second hand but it should last you a good year or two. Decide which grade you are happy to settle for and research prices for that spec only – many trade in stores will have a shop to buy phones back too. These are often legitimately tested when they come in and resold in a good condition. If you have a network carrier and a sim card which you are happy with, then make sure the phone you’re buying is compatible with this. Either check to see if the handset has been unlocked from a service provider, or is locked to the same one you use – e.g. if a cell phone is listed as Verizon and you have an AT&T sim card it won’t work straight out of the box. Just check the costs of this as not all carriers offer a free service and you’ll have to dig in your pockets for the cash to unlock your new device. Make sure the device you are looking buy is not stolen, especially if you are buying from ebay or Craigslist. A stolen phone will become unusable and there is very little you can do! Get the IMEI number and either use Apple’s iCloud history tool, or find an IMEI checker online. This will check the history of the device so you can see who the last registered owner was. Obviously the risk of you buying a stolen phone is higher on some sites than on others. For example, a site like Craigslist or ebay would be riskier than using a certified refurbished phone company, which will have company details, BBB and other ratings online for you to review. It is your job to check the phone isn’t stolen! 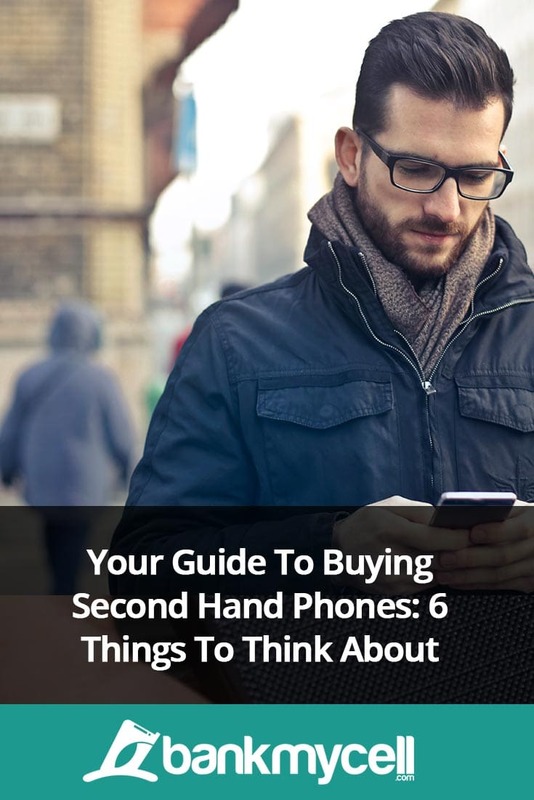 You have two options when it comes to buying a second hand phone. You can either take the direct seller route via sites like eBay, Amazon or Gumtree, or you can take the refurbished phone route from companies which fix up faulty phones. Refurbished phones are phones which have been sent back to stores by customers due to fixable faults, or just sold on by customers back into the buyback / recycling / trade-in market. These phones will be tested and repaired to full working order, plus they come with a warranty. This is one of the key plus sides of buying a refurbished phone over a used one. Each refurbished phone will come with a different warranty, and usually depend on the grade of the phone. The warranty means that you have protection if the phone develops a fault. These phones may be more expensive, but could save you a lot of hassle. You will find used phones on seller sites and even in local Facebook groups. They’re usually sold by private sellers, and are unlikely to come with a warranty. There is also very little legal come back if you purchase a phone from them and it is faulty or you change your mind. That being said, if you do your research right, meet the seller and decide whether you trust them and can see the phone is in working order then you can still bag a good deal. You have more freedom to haggle on price. Make sure you check exactly what condition it is in. Find out how long the battery lasts, and if there are any cracks or scratches. For phones in the best condition look for those described as ‘nearly new’ or even ‘as new’. To make your deal even sweeter, consider selling your old phone on once you have sorted the new one. You can get hundreds of dollars for old phones depending what model it is, and this could be enough to pay for the new one. You can either take the private seller route by setting up a listing on a site like ebay, or you can try using a phone buyback program which could be an easier way to get cash. User a comparison site like BankMyCell to evaluate the market and find you the best price, then simply pick a seller and send off your device with the FREE shipping packaging or label you should be sent. This has been proven to be a great way to make money from old phones quickly! And will put money back in your pocket after you’ve bought your new second hand phone. Let me know if you have any more tips or questions by leaving a quick comment below right now!